Author: The Craft of Writing, The Business of Writing, and the Literary Life. William Shakespeare, Jonathon Swift, Oscar Wilde, and Mark Twain may be the most familiar practitioners of the form, but now we have another member of this illustrious club. Largely the purview of cartoonists in today’s world, a brilliant newcomer steps up to stage. Long in the habit of reading the winner of the Man Booker Prize, this year’s choice did not disappoint. The committee is given the challenge of reading the longlist and then narrowing the field to the shortlist. While it is a daunting task, it is one I would sign up for any day of the week. Choosing the best work from an astonishing array of talent would not be easy, and I can imagine the lively dialogue of dissenting voices. Bookmakers in England bet on the favorite and the choice is never easy. However, one clear voice emerged over all others. Paul Beatty won the coveted award this year. 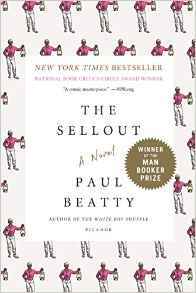 “The Sellout puts you down in a place that’s miles from where it picked you up.” Dwight Garner, The New York Times. It is not the subject matter or the form alone that intrigues me. Paul Beatty writes with a voice that is so present, it sings. “When I was ten, I spent a long night burrowed under my comforter, cuddled up with Funshine Bear, who, filled with a foamy enigmatic sense of language and a Bloomian dogmatism, was the most literary of the Care Bears and my harshest critic. In the musty darkness of the rayon bat cave, his stubby, all-but-immobile yellow arms struggled to hold the flashlight steady as together we tried to save the black race in eight words or less. Putting my homeschool Latin to good use, I’d crank out a motto, then shove it under his heart-shaped plastic nose for approval…. Semper Fi, Semper Funky raised his polyester hackles, and when he began to paw the mattress in anger and reared up on his stubby yellow legs, baring his ursine fangs and claws, I tried to remember what the Cub Scout manual said to do when confronted by and angry cartoon bear drunk on stolen credenza wine and editorial power. ‘If you meet an angry bear-remain calm. Speak in gentle tones, stand your ground, get large, and write in simple, uplifting Latin sentences. Unum corpus, una mens, una cor, unum amor. One body, one mind, one heart, one love. Sitting in Quaker State garage, nestled in among an array of tired magazines, the vending machine, and the blaring television set, waiting for the man to come out from the hole in the floor under my car, I was glad to be alone in the small waiting room. If anyone were to observe me reading the last pages of The Sellout, they would have seen a perpetually silly grin on my face. I wished I hadn’t blasted through the book so quickly because the uplift was a welcome respite. I hope I don’t have to wait so long to read a work of great social satire again. This entry was posted in fiction and tagged Paul Beatty, social satire on November 23, 2016 by Elizabeth Smythe Brinton.